Although she now lives in the Westminster Canterbury retirement complex on Shore Drive, my Mom Eleanor Marshall still owns the small oceanfront house at 83rd street in Virginia Beach. My sister Jane and her daughter Annie are currently living there. Despite the fact that I have not really lived in Virginia Beach for over forty years, I have on and off bicycled around Virginia Beach and Norfolk since about 1966. I realized that I had never bicycled round trip from the oceanfront to downtown Norfolk. I was in town for two nights so I took the opportunity for this one day trip on a Friday. The cities of Virginia Beach and Norfolk have a sibling’s long and sometimes bitter relationship. Maybe I could discover some insight. Because of the suburban sprawl I knew it was not to be a particularly pleasant bike ride. I did expect the first quarter of the ride through the state park to be nice. It was a sunny but cold day with temperatures starting in the low thirties, getting up to the fifties by the afternoon. I put on gloves and balaclava at 7:30 AM at 83rd Street and biked south to 64th street, to connect with the dirt trail through First Landing State Park. In the 1970’s this trail was called The Old Country Lane. It is five miles of continuous woods, coming out near the bike path along Shore Drive. The subsequent paved bike path along Shore Drive leads right to Westminster Canterbury. Once you get over the fact that everybody living there is old, WC has a friendly liberal vibe. The residents make a visitor feel welcome. The food is good. I had a delightful breakfast with Mom even though she had to send back the pancakes, because they forgot the blueberries. An hour or two later I left Mom and the bike riding got more contentious. The Lesner Bridge over Lynnhaven Inlet is being rebuilt but there is a new pedestrian path that lets a bicyclist feel reasonably safe. Virginia Beach, like most of America, does not make bike riding easy. Once over the bridge I was able to weave through the streets of Chick’s Beach before crossing Shore Drive and heading west on First Court Road . From there it was Shell Road to its termination on Northampton Boulevard. (David Consolvo, does your family still own those apartments there?). I had to daringly bike along Northampton for about a quarter mile before taking a hard right on the much calmer Baker Road. Believe it or not, this led to the long but gentle Miller Store Road that loops around the runways of Norfolk Airport. From that to Robin Hood Road. And hell yes; before I realized it I was in the Norview area of Norfolk. A little further is a part of town my Dad used to talk about; he said that the streets were named after World War One battles. In an African-American neighborhood a diverse crowd stood around Manny’s Burger. I would have stopped for lunch but there was no place to sit down. Weaving through the city streets I eventually ended up on the thriving commercial strip of Twenty-First Street. 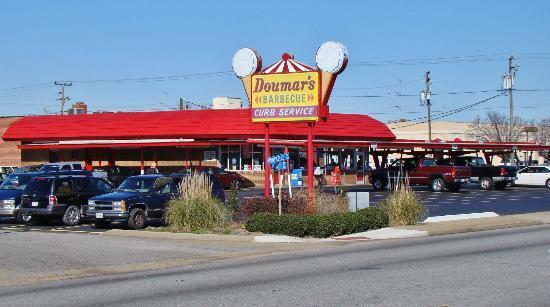 I had just finished eating at a chain sandwich restaurant before I remembered I was just a couple of blocks from Doumar’s, over a hundred years old and claiming to have invented the ice cream cone. From there it was an easy slog to downtown. At this point I realized it was a long way back to the oceanfront, so I cheated a little and rode a small portion of my return on the light rail line, The Tide. Sometimes nothing is more politically charged than mass transit because what it represents. To those who support light rail, even if they never ride the thing, it represents Virginia Beach and Norfolk becoming one urban city; somewhere where sometime maybe a car would even be optional. To the detractors the opposite is their selling point. They live in their suburban island; this transit system, this THING, would bring Norfolk’s diversity into Virginia Beach by the trainload. Even though Virginia Beach is now about as diverse as Norfolk. And the train requires government subsidies, taxes! An abandoned rail right-of-way has sat empty through the center of Virginia Beach for seventy years, and the question of whether to build light rail on that line has gone back and forth for seemingly forever. Norfolk had the funding in place and finally went ahead and built their portion, opening in 2011. It extends all of seven miles and stops at the Virginia Beach border. Virginia Beach in the 2016 election had ANOTHER referendum on the issue, and it looks like the rail line may never extend any further. But the train was quiet and pleasant and I could wheel my bicycle onto it with ease as I left Granby Street downtown Norfolk. I got off the train at the end, at Newtown Road. From there a bicyclist has to dodge cars and look for secondary roads. Three or four miles further I ran into Virginia Beach Town Center, built mostly in the past fifteen years. I truly believe that the rivalry between Virginia Beach and Norfolk has poisoned the well for this metro region of 1.7 million. Many of the leaders of Virginia Beach, now the most populous city in all of Virginia, actually grew up in Norfolk. But there seems to be a lot of resentment. Virginia Beach, other than the small strip along the beach, had never been anything other than a collection of housing developments. The leaders of Virginia Beach have built what I call a fake downtown, replacing the semi-dead Pembroke Mall. It is ten miles east of Norfolk’s real downtown. I biked up to the Virginia Beach Town Center, which is designed to look impressive from a distance. Other than to stop and use the bathroom at a chain restaurant, I just slogged on, about ten miles further. Much of the way it was along Virginia Beach Boulevard, either on the sidewalk or the feeder road. It was OK, and I biked this route many times in the 1970’s, but I am sure this is the last time I will ever do this. I did not stop until I got to the Starbucks at Pacific Avenue and 31st Street, one block from the ocean and the boardwalk. I was almost back, so I could relax with a latte.